More Norwegian price lists are coming soon, including stamp lists. 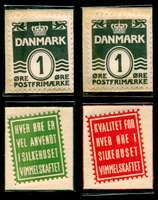 These pages (and the PDF and printed price lists) do not yet include the usual listings of "regular" Norwegian stamps. I do have a very large stock of the stamps and I am happy to send stamps from your want list. I am sorry for the inconvenience, but if you will send your want list, I can help you! 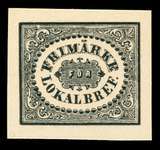 Check the drop-down menu on any of these pages for an expanded listing of pages for postmark types and also arranged by stamp issues. Inquire for the later style of date blocks, NK blocks, cylinder blocks, etc. WWII Norwegian Legion Label (Nazi sympathetic Norwegian soldiers intending to defend Finland against the Soviet Union).